Where Can I Find Affordable Wood Fencing Services in Houston? Affordable wood fencing services can be found at Lone Star Fence & Construction. Located in Friendswood, Texas, our company offers the greater Houston area competitive pricing on commercial and residential fencing services. The services offered by our experienced employees range from help designing and creating the layout of a new fencing structure to installation. Our company offers commercial and residential customers with a variety of affordable options when it comes to wooden fences. We have a variety of different styles, colors, and high quality woods to choose from, which allows our customers to create a personalized fencing structure while staying within a set budget. Our commitment to superior customer service allows us to help both our commercial and residential customers find affordable fencing. Whether the fence is being used for decorative, privacy, or security purposes, our employees will help guide our customers through the entire process from purchasing materials to installation. Call Lone Star Fence & Construction to learn more about our affordable and competitive prices. Reliable Wood Fencing Companies in Houston? Lone Star Fence & Construction is one of the most reliable fence companies in and around the greater Houston area. Our company has provided premium level customer service to both residential and commercial customers for over 10 years. In addition to our superior customer service, we provide our customers with access to high quality materials that help build stable, reliable fencing structures. We pride ourselves on helping customers through the entire fence building process. Our experienced employees will help design and create a fencing structure, make recommendations for materials, and install the structure. Contact us at Lone Star Fence & Construction to learn more about our superior customer service and use of high quality, reliable materials. Who Offers the Best Wood Fencing Services in Houston? Operating out of Friendswood, Texas, Lone Star Fence & Construction offers the best fencing services to the greater Houston area. 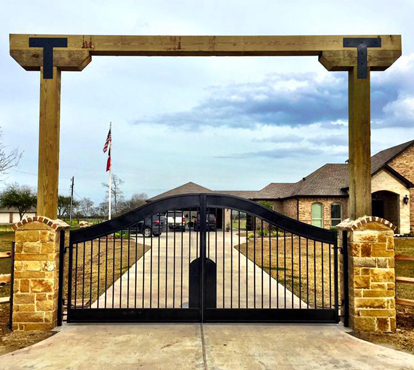 The combination of superior customer service and use of high quality materials makes our company one of the best fence companies in Houston. For over 10 years, our company has helped residential and commercial customers obtain the wooden fences they want and need. Our company has assisted customers in creating all types of wood fencing from decorative structures to security privacy fences for both private residences and commercial properties. One of the qualities that make our company one of the best in the Houston area is our commitment to customer service. We help our customers through the entire fence building process from picking out the right materials to making sure the structure is properly installed. Every project, no matter how big or how small, is important to us, which is why we are committed to providing superior quality customer service. Call us at Lone Star Fence & Construction to learn more about our fencing services for commercial and residential wooden and wrought iron fencing. What are the advantages of Wood Fencing Over Other Types? Clean the fence – Remove dirt and mold by cleaning your fence using a pressure washer. There are mold removal products that you can attach to a pressure washer to remove any mold. Make repairs – Thoroughly check your wood fencing for any damage. Look for fasteners that need to be reseated or wood panels that need to be replaced. Rotting panels should be removed before the rot spreads. Stain or paint the wood – By staining or painting your wood fence, you’ll help protect it from warping or twisting that’s caused by prolonged exposure to sunlight and rain. Doing so can also help protect it against mold growth. If you’re thinking about putting up a fence around your property in order to provide a bit of privacy, then you don’t necessarily need to build a bland-looking wall – you’ve got a ton of options, especially when it comes to wood fencing. Here are a few wood fence options that not only provide privacy but also add to your property’s curb appeal. Dog eared fence – These fences curve downwards at the top to give it a unique look. The curve makes it easy to keep a uniform appearance throughout the length of the fence, even if your property has a lot of hills. Lattice fence – A lattice fence contains a tight pattern of crossed wood at the top that allows you to look through your fence without sacrificing a feeling of privacy. Picket fence – If a solid wood fence makes you feel too secluded, a picket fence can prevent your property from being completely closed off visually while still retaining some privacy. Environmentally-friendly. Wood is a renewable resource that can be easily grown and harvested, and has quick disposal without major repercussions. This makes wood fencing a particularly safe and natural choice, especially when compared to non-degradeable alternatives like chain-link and vinyl fencing. Customizable by budget. Wood fencing is highly customizable, both in appearance and in budget. Owners can choose from designs like picket, split rail, table top, lattice top, paddock, and others. This wide range of fencing styles and types lets owners choose the right fence for their property while still being conscious of budget constraints. Classic fence appearance. Wooden fencing look great immediately after installed, and wood matures over time, especially varieties like cedar, making it settle nicely into the surrounding environment. Low maintenance. Wood fencing can be easily maintained with soap and water cleaning, and missing or broken fence boards can be readily replaced if damaged. 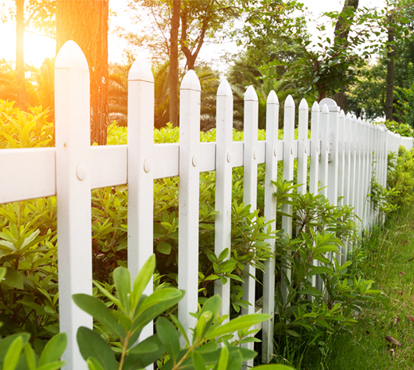 While you might need to replace a picket or a post from time to time, wooden fences can last for up to 20, sometimes even 30 years when kept properly maintained. Plus, many varieties of wood, such as cedar, actually achieve a more desirable look with age. Fences rarely come cheap, with some iron fences costing upwards of ten thousand dollars and more to purchase and install. As a naturally occurring resource, wood doesn’t have a ton of manufacturing costs and thus is a much more affordable options for most homeowners. A wooden fence’s arguably greatest quality is its attractiveness. Wood fences offer a timeless and rustic appeal that will add to the appearance of most any home. In fact, the addition of a wooden fence can greatly increase your home’s curb appeal, in addition to its actual property value as beauty pairs with function. When choosing which kind of fence to go for, there are a few factors that need to be taken into consideration. You certainly want a material that is durable, long-lasting, and will match the exterior of your home or commercial space. It also needs to suit your budget. There is a great reason why wood fencing has been the top choice of property owners for many years. It stands the test of time. When choosing fencing material, there are a lot of advantages wood has to offer. The look of a wood fence is classic and traditional. It contributes to the image of your home, and can raise your house’s resale value. Wood blends easily with nature, and can add to the relaxed feel of your garden or yard, while still providing privacy. Wood is also very customizable, and you can choose the type of wood and adjust designs to get your own custom look. There are plenty of stain and paint options for wood as well. Wood can be easily maintained, and will not rust or degrade with proper care. Repairs can be made inexpensively and easily. As your fence grows older, the matured look of the wood can add extra appeal, contributing to the atmosphere of your home. There is also the environmentally friendly aspect of wood, as it is a renewable resource and the material is all natural. Finally, the cost of building a wood fence is very affordable compared to other materials, ensuring that you can have a beautiful fence that will fit your budget. There are many advantages to installing a fence. Fences provide security and privacy for your home, and clearly delineate property lines. Fences may also enhance your home’s appearance and value. Although, you may be on the fence, so to speak, about which fencing material is right for your needs. Cost: If you’re like other savvy consumers, budget is always an important factor when undertaking a home project. The end cost of any project depends on numerous variables. Generally speaking, wood fence installations are less expensive than vinyl, iron and masonry, but more expensive than chain-link fencing. Customization: Wood fences offer a great advantage for quick and simple customization that is just not practical with other fencing types. 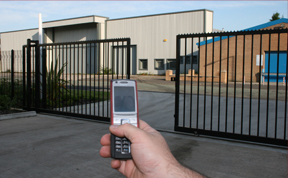 Maintenance and repairs: All fencing types are going to require maintenance and repairs. Again, wood fences are split with a strong advantage for easier and considerably less expensive repairs. However, wood fences may require more maintenance through the years. Literally the “green” choice: Wood fences are the “greenest” available of the common fence materials. Moreover, there are many options to dispose or re-purpose wood fencing.